Anisocoria, defined as unequal diameters between the two pupils, is a common finding in neuroophthalmology. If the difference in diameter between the pupils is 2 mm or less, then anisocoria is generally physiological. Pathological anisocoria occurs due to an imbalance between the sympathetic and para-sympathetic components of the autonomous nervous system.1 Although generally benign, it may also be the single finding of a life-threatening disease.2 The angel's trumpet (Datura suaveolens) (Figure 1) is a natural alkaloid plant containing a high level of scopolamine.3 Contact with the plant may cause anticholinergic toxicity. A 10-year-old girl presented with blurred vision and enlargement of the right pupil. No headache, double vision, ptosis, nausea, vomiting, or other neurological symptoms were present. She had no history of infection, fever, trauma, or systemic, local, or topical drug use. No additional pathological finding other than anisocoria was observed during the physical and neurological examinations. The ophthalmological examination revealed bilateral 10/10 visual acuity, unrestricted eye movements in all directions, and bilateral orthophoric eyes. The right pupil was dilated, with a diameter of 8 mm. Right direct and indirect pupil light reflex and accommodation reflex were unresponsive. The diameter of the left pupil was 3 mm, and light reflex and accommodation reflex were normal. The bilateral optic disc, vessels, and macula were normal. Intraocular pressure was 14 mm Hg in the right eye and 12 mm Hg in the left eye. No change occurred in the right pupil during the 2% pilocarpine test, whereas contraction (myosis) was determined in the left pupil. Paralytic mydriasis was excluded, but pharmacological mydriasis was suspected. The patient and the family were asked about the presence of mydriatic drugs and the possibility of their use, but they replied negatively. Cranial and orbital magnetic resonance imaging results were normal. When the literature was researched, the angel's trumpet plant was found to be a rare cause of anisocoria. A picture of the plant was shown to the child. She recalled that she had picked a similar flower while playing near the school garden, and its sap had come into contact with her eye. The patient was placed under observation without treatment. The anisocoria resolved spontaneously on the third day, and the patient's vision returned to normal. The school's staff were informed about the possible risks associated with the angel's trumpet plant, and the plant was removed from the garden near the school. Various ophthalmological and neurological diseases should be considered for patients with unilateral, dilated, and unresponsive pupil.4 Anisocoria may be physiological, but may also indicate a severe and potentially life-threatening condition.1 It may occur as a result of blunt trauma, Adie's tonic pupil or intracranial third nerve involvement, mydriatic drug application, or contact with plants containing alkaloids.4,5 There was no history of blunt trauma in our case. Third nerve palsy may occur due to vascular diseases, demyelinating diseases, tumors, granulomatous diseases, diabetes mellitus, or hypertension. Third nerve palsy was excluded in this case due to the absence of neurological symptoms, eye movement disorder, and ptosis. Adie's tonic pupil results from postganglionic parasympathetic pupillomotor injury. It may be seen following varicella zoster, giant cell arteritis, or orbital trauma. Eighty percent of cases are unilateral. The iris sphincter is extremely sensitive to topical parasympathomimetic solutions. The pupil contracts with low concentrations of pilocarpine (0.1%). Light-near dissociation is present.1,4 Adie's pupil was excluded in this case because these features were absent and there was no extreme reaction to the 2% pilocarpine test. Anisocoria can develop after contact with plants containing alkaloids. The patients should be evaluted for systemic toxicity. No signs or symptoms of systemic intoxication were determined in our patient. This case report emphasizes the importance of considering herbal mydriatics in patients with acute, isolated, unilateral mydriasis. 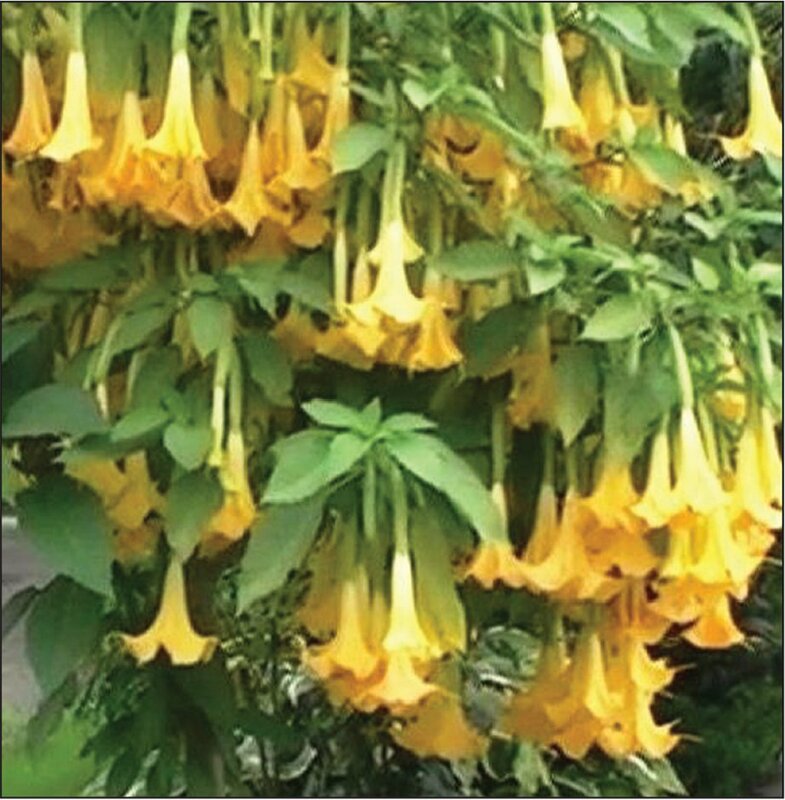 It is also important to raise public awareness about the potential risks of the angel's trumpet plant, particularly in areas close to schools and playgrounds. Wilhelm H, Wilhelm B, Schiefer U. Mydriasis caused by plant contact [article in German]. Fortschr Ophthalmol. 1991;88:588–591. Al-Shaikh AM, Sablay ZM. Hallucinogenic plant poisoning in children. Saudi Med J. 2005;26:118–121. Van der Donck I, Mulliez E, Blanckaert J. Angel's trumpet (Brugmansia arborea) and mydriasis in a child: a case report. Bull Soc Belge Ophtalmol. 2004;292:53–56. From the Division of Child Neurology, Department of Pediatrics, Ege University, Izmir, Turkey (HMS, SY); and the Izmir Tepecik Training and Research Hospital, Department of Ophthalmology, Izmir, Turkey (BO).